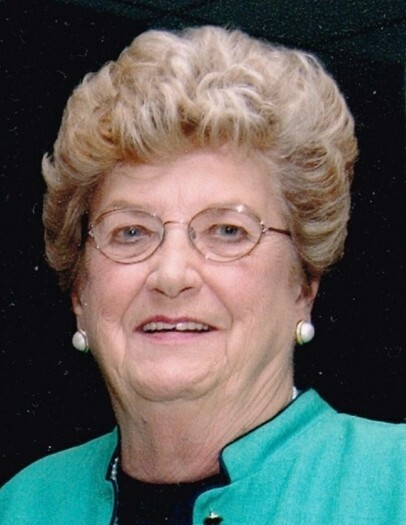 Mary Ann (Burns) Muoio, 88, of Mantoloking, NJ entered into eternal rest on August 30, 2018 surrounded by her loving children. Mary was born on October 5, 1929 in Elizabeth, NJ. The daughter of the late Gerald T. and Zita (Finn) Burns of West Orange, NJ. She graduated from Our Lady of the Valley High School, Orange, in 1947. Mary continued her education at the College of St. Elizabeth, Convent Station and graduated from the Berkeley Secretarial School, East Orange in 1949. From 1949 to 1958, Mary was office manager of Kruse Engineering Co., Newark. Along with her husband, Guy, Mary founded GUYMAR Construction Company in Livingston, NJ in 1975. Livingston was her home for 45 years until moving to Mantoloking in 2003. Mary was a Communicant and member of both Rosary Societies of the Church of St. Philomena in Livingston and the Church of the Sacred Heart in Bay Head. Mary travelled extensively to many countries and several cities within the United States. She was an avid reader, an excellent cook, enjoyed playing bridge and especially enjoyed living at the shore and hosting family gatherings. Mary leaves a legacy of unselfish love to her late husband, Guy, of 59 years, and to her five children and their families. Surviving are her three sons; William Muoio, his wife Mary Jo, Thomas Muoio, his wife Courtney, Kevin Muoio, his wife Sarah, and two daughters; Marianne Weber, her husband Douglas, and Kathleen Muoio. Also surviving are 11 grandchildren, one grandson-in-law and 2 great-granddaughters. She also leaves a sister, Zita O’Brian, and many nieces and nephews. Mary was predeceased by her brother, Rev. Msgr. G. Thomas Burns, former pastor of St. Raphael Parish, Livingston. Mary was the grandniece of Rev. Michael J. McGivney, the Founder of the Knights of Columbus. Visitation at the Leonardis Memorial Home, 210 Ridgedale Ave., Florham Park on Tuesday from 2-4 & 7-9pm. A Mass of Christian Burial will be held on Wednesday, 9:30am at the Church of St. Philomena in Livingston. Interment to follow at Gate of Heaven Cemetery in East Hanover.